The ARRL September VHF contest is the last major VHF contest of the year, and it comes at a time of year when chances for long distance propagation are slim. What this does is remove a certain randomness to the contest. For the Limited Rover, it means making long roves to hit population centers on all four bands, instead of trying to be in a few spectacular spots when 6 meters opens up. When planning my rove for this contest, I intended to hit all the grids in all the population centers I could, and I scheduled stops down to the minute. A successful rove would then mainly be determined by how well I stuck to schedule…unless, of course, a sporadic E (Es) opening happens to occur (spoiler alert: no Es openings happened). I had an ambitious schedule of hitting ten grids. I’ve done ten grids when using an airplane to get between spots, but this was an all-terrestrial event for me. And hitting ten grids and spending time on mountain tops takes some effort. On that topic, the last time I roved out of the airplane was last September (2012). I didn’t exactly make a decision to stop airplane roving. Rather, as each contest came around, I watched the weather and thought about options and contingency plans. In the end, the uncertainty of getting out of the airport in the morning because of weather was simply too much. Besides that, my land rover has evolved into a much better platform than the airplane rover, and I can fruitfully rove in motion out of the truck; I cannot make contest QSOs while flying the airplane by the contest rules. Will I rove out of the plane again? Probably, but not until next July at the earliest. The station was quite similar to what I used in the June VHF contest (photo here). The one major equipment difference was that I replaced the RM Italy KL-145 with a RF Concepts 2-417 170 Watt amp (with a preamp). A more minor change was the addition of an antenna cross-over switch to flip the 222 MHz transverter and 223 MHz FM transceiver between the front and rear antennas. This would allow either radio to use either the front or rear antenna. The switch was made of 4 SMA SPDT latching relays acquired from ebay. The antennas were pretty much what I used in June, except that I used the “stretched” WA5VJB eight element 2 meter “Cheap Yagi that I built for the CQ VHF Contest, and I replaced the 11 element 432 MHz “cheap yagi” with the 12 element LFA yagi I had built for the August ARRL UHF contest. You can also see a dual band 146 MHz/440 MHz vertical antenna for the FM portions of those bands, and a 1/4 wave whip to monitor 6m FM. Saturday began with an 8:00 AM departure for the three hour trip to Ocean Shores. About 30 minutes before the contest started, I heard Mike, KD7TS/R setting up in Ocean Shores, talking on 2 meters to Gabor, VE7JH in his mountain top contesting site on Vancouver Island. Gabor was surprisingly strong and easy to copy. I learned that Gary, WA7BBJ/R, was also setting up in Ocean Shores. Thus, we were going to have something of a rover party out there. I got to the parking lot of the Ocean Shores airport about 15 minutes before the start. In the middle of setting up, I was approached by a gentleman with a couple of HTs on his hip. It was Eric, AE7HC, who lives in the area. We chatted while I was setting up, and exchanged frequencies for 2m and 432 MHz simplex QSOs. Eric went home and called CQ after the contest started. I worked him and his wife, Melanie, KF7KNW, on 2m and 440 MHz FM from their CN76 QTH. I also worked John, KF7PCL, in CN76 on 6m and 2m, plus KD7TS/R in CN76 on four bands. In fact, I had more CN76 QSOs in my log than anything else by the time I departed the grid. A few blocks away, I set up on a dirt pull-over spot. The spot was fruitful, with 39 QSOs in the scheduled time. It helped that KD7TS/R worked me on 4 bands from CN76 and then again when he moved to CN77. Since I was only a few blocks away from CN76, I returned to the grid to work KD7TS/R four more times. I also worked WA7BBJ/R in CN76 on four bands during the brief return. What is striking about this trip to Ocean Shores was the diversity of grids worked. I had QSOs on one or more bands for CN76, CN77, CN85, CN86, CN87, CN88, CN89, CN96, and CN98. This doesn’t reflect my station so much as it does an overall increase in activity in the Pacific Northwest for this contest. The next part of the trip was a long slog through CN87 and CN86 down toward Oregon. 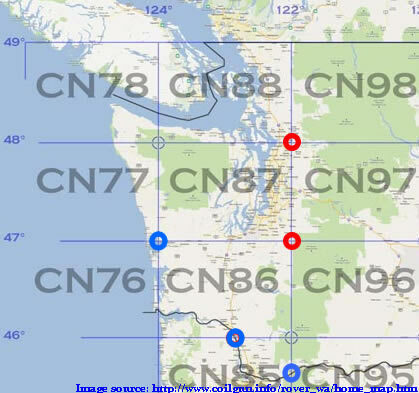 I took a slightly longer route that carried me immediately and briefly through CN87 and into CN86, permitting me to ensure QSOs from these grids with my many friends back in Ocean Shores. Then it was off to Kalama, WA, mostly through CN86. I actually took a detour back into CN87 by picking up I-5 in Olympia. That minimized my time in an RF dead zone along that route. It may have helped a bit. Still in the two hour period from 2200 to 0000 UTC, I made only 7 QSOs. What a spot this is! I made 41 QSOs in the 75 minutes spent there, from Gabor, VE7JH, in BC, to John, KF7PCL, in Ocean Shores, to a bunch of folks in the Portland area. I also worked my friend Doug, AC7T, who was using the portable 3 element 6m yagi that I would normally use out of the airplane rover. I figured this was a spot with a sure path into Portland, but with some possibility of working E. Washington. I quickly worked Bruce, KI7JA, in Portland on all four bands. Before the contest, I had mentioned on the Pacific Northwest VHF Society reflector that I was going to this spot. Paul, K7CW, emailed me to say he thought he might be able to work me on 6 meters from his CN87 QTH near the southern hook of Hood Canal. And he was right! I also worked Dale, KD7UO, on 6m. He was 50 miles directly north of me at about 6,000′ in CN96. In all, I made 12 QSOs from the spot at a time when the QSO rate usually drops off. It was a fun experiment. The down side to activating this grid was the 2 hour drive back to Centralia, WA where a motel room awaited me. I did manage to work a couple of Portland stations in CN85 on along the way. I hit the sack at 12:30 am with my alarm set for 5:45. Sunday morning I was up bright and early for a 6:15 AM departure with a two hour drive to my next stop. The drive from Centralia to Carbonado was unproductive in CN86. Once I hit CN87, however, things picked up. I made 22 QSOs in the last hour in CN87 while in motion. And I snagged five more QSOs in the 5 mile stretch of CN86 along Mowich Lake Road before hitting CN96. The one piece of equipment problem I was having was that my 222 MHz transverter was going into overload mode. To make matters worse, I had accidentally unplugged the 223 MHz FM rig when connecting the battery in the morning (while it was still dark out, I might add). I stopped to hook up the 223 MHz to the battery. And when I got to CN96, the transverter decided to behave itself again. This spot, at about 3,200′ on Mowich Lake Road, was reasonably productive, with 56 QSOs in 90 minutes. Dale, KD7UO, worked me early and welcomed me to the grid. He was now about 45 miles south of me. I made a 40 minute stop in CN86 at about 3,000′ on Mowich Lake Road. This was my fifth rove into the grid during the contest, and I didn’t think there would be many people left to work. The 19 new QSOs included four with KC7NOL/R (in two grids) and two with KD7TS/R. People were talking about a thunderstorm. From my elevated perch I could see clouds over the Puget Sound region and the noise of an electrical storm was audible over the radio, but the weather for me was mostly sunny with few clouds. Reaching this spot involves about 30 to 40 minutes of traveling on a forest service road full of periodic pothole fields. At the end is a short, steep road to the peak that has overgrown vegetation that is hell on the antennas. But, at 3,100′, the location is excellent to the north and west for VHF and UHF and is pretty darned good to the south with the mast sticking just above the nearby rocks. As it happened, I didn’t work much south, but made 60+ QSOs in 90 minutes to the north and west. The next stop required a trip from the SE to the NE corner of CN87. I had planned to take a long route up the I-5 corridor that would minimize time spent in valleys. But I was running about 25 minutes behind schedule. The direct route (via I-405) was a shorter, 2 hour, journey. I managed 16 QSOs en route. Lake Stevens High School, at 400′ MSL is consistently mediocre. But I haven’t identified a better CN88 spot near the CN87/CN88/CN97/CN98 intersection. I arrived five minutes ahead of schedule and hastily extended the rear mast. The skies were threatening, electrical crashes were killing 6m, and people were mentioning thunderstorms. After making 27 QSOs in 45 minutes, the storm hit. I quickly lowered the mast, just in time to enjoy a minute of light hail followed by a burst of heavy rain. This was my first trip to this CN98 spot on a small pull-over along a forest service road. It looks like a glorious spot, but I couldn’t really tell because of the clouds and arriving darkness. And the approaching thunderstorm. I had worked Ray (W7GLF/R) on all four bands, CN98 to CN98, en-route. Ray reached CN88, and we made four more QSOs. Later on, he entered CN87 and we make another four. Then he got home (in CN87), went in the house, started a new log, and worked me on four bands as W7GLF (no /R this time). That contributed 16 of the 39 QSOs I made in CN98. The thunderstorm was about to hit with two minutes left in the contest. I decided to shut down early and lowered the rear mast in record time. Travel back down the mountain was slow going. The potholes were filled in with water meaning I couldn’t tell how deep they were, it was dark, and I was in the clouds most of the time. The only thing working in my favor was the frequent flashes of lightening that brightly illuminated the road ahead of me. In the end, I activated all ten of the planned grids. I took extra efforts to keep to schedule, including use of a kitchen timer to give a five minute warning. The system worked well. The one recurring issue I had was RF getting into my audio. This is after putting multiple turns of the cable through a clip-on ferrite bead. With the headset on, and audio monitoring turned up, I could move the headphone cable around to minimize the problem. I hate to go back to microphones, which are hard to use while driving, so a solution is the technical challenge for January. The total number of QSOs was 460, for 607 points. That makes a total of 36 grid-band pairs. To that we add ten multipliers for the grids activated for a total of 46 multipliers. The final score was 27,922 (before checking by the ARRL). Last year I had 32 grid-band pairs and nine grids activated for 41 multipliers, and 398 points for a raw score of 16,318. My score improved quite a bit this year. This is mosty attributable to greater activity, but a better roving platform and sticking to my schedule really helped. The number of rovers this year was remarkable. Here are all the rovers (# QSOs) in my log: KD7TS/R (28), W7GLF/R (19), WA7BBJ/R (18), KC7NOL/R (11), N6ZE/R (6), K7BWH/R (2), KE7IHG/R (1). KE7IHG/R provided my only (and much appreciated) QSO into CN95. The top stations (# QSOs) in my log were: KE7SW (32), N7EPD (32), VE7JH (31), KE0CO (25), W7LUD (25), KG7P (17), K7ND (16), KI7JA (13).